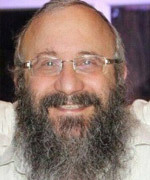 Jul 1 2016 - Rabbi Michael "Miki" Mark, 48, a father of 10 and the director-general of the Otniel Yeshiva, was killed by a Palestinian gunman as he drove on Route 60 in the South Hebron Hills near the Aduraim Junction. The rain of bullets against the vehicle Rabbi Mark was driving causes it to overturn. His wife and two of his children, ages 14 and 15, who were with him in the car at the time, were also wounded in the incident. Aduraim Junction is located about 15 kilometers from Kiryat Arba, where on the previous day (Thursday, 30 June 2016) a Palestinian terrorist infiltrated the home of 13-year-old Hallel Yaffa Ariel, and stabbed her to death while she was asleep in her bed. Rabbi Michael "Miki" Mark was laid to rest on Sunday (3 July 2016) at the Har Hamenuhot cemetery in Jerusalem.